The BXR series of reversible vibratory plate compactors from Doosan Portable Power are engineered for the best compaction of granular soils, mixed soils, and well-grated aggregates. The BXR-60H has been designed with both maneuverability and machine longevity in mind. The BRX-60H reversible vibratory plate compactor from Doosan Portable Power is built tough to tackle any job you encounter. 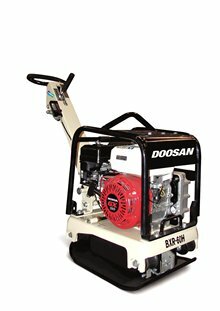 The BXR-60H reversible vibratory plate compactor from Doosan Portable Power features an open blasé plate design, which allows dirt and rocks to slide off the plate for easy cleanup and maintenance . A protective engine cage with integrated lifting bail surrounds the Honda GX120 engine and provides engine protection and easy loading placement into trenches. Doosan Portable Power has designed the BXR-60H to be highly maneuverable, making operation easier and more efficient.